قاسمی‌نیا, راضیه, متقی, خلیل, قدس, عبدالرضا, طالبیان, مرتضی, چن, لینگ. (1397). کاهندگی طیفی جنبش زمین در فواصل کانونی نزدیک. مجله ژئوفیزیک ایران, 12(3), 87-106. راضیه قاسمی‌نیا; خلیل متقی; عبدالرضا قدس; مرتضی طالبیان; لینگ چن. "کاهندگی طیفی جنبش زمین در فواصل کانونی نزدیک". مجله ژئوفیزیک ایران, 12, 3, 1397, 87-106. قاسمی‌نیا, راضیه, متقی, خلیل, قدس, عبدالرضا, طالبیان, مرتضی, چن, لینگ. (1397). 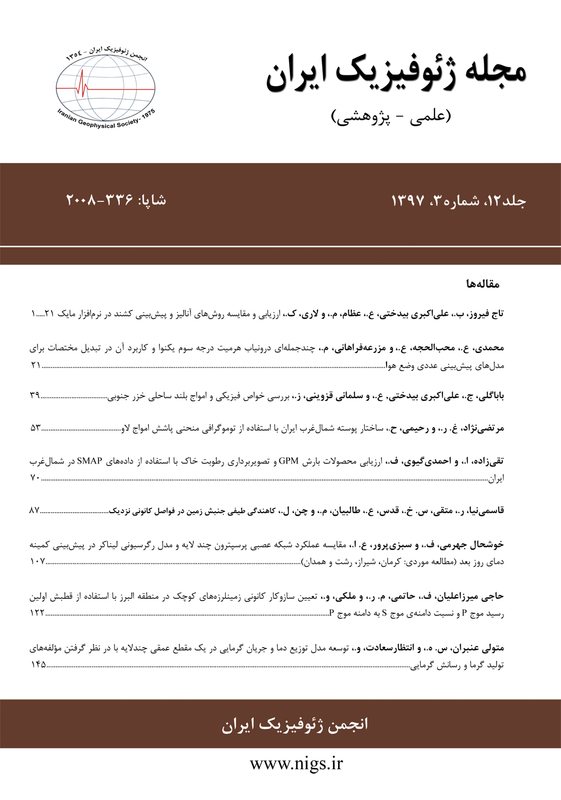 'کاهندگی طیفی جنبش زمین در فواصل کانونی نزدیک', مجله ژئوفیزیک ایران, 12(3), pp. 87-106. قاسمی‌نیا, راضیه, متقی, خلیل, قدس, عبدالرضا, طالبیان, مرتضی, چن, لینگ. کاهندگی طیفی جنبش زمین در فواصل کانونی نزدیک. مجله ژئوفیزیک ایران, 1397; 12(3): 87-106. کسب اطلاع از نحوه کاهش دامنه امواج لرزه­ای در فواصل نزدیک نسبت به چشمه زمین‌لرزه‌، ﻧﻘش مهمی در تحلیل خطر لرزه­ای دارد. گسترش هندسی، پارامتر اصلی کنترل‌کننده کاهندگی در فواصل کانونی نزدیک (کمتر از 70 کیلومتر) است. برای مطالعه گسترش هندسی موج برشی زلزله­های کم­عمق در فواصل کانونی نزدیک، منحنی کاهندگی تجربی برای دامنه­های طیفی در ناحیه طارم‌- رودبار واقع در منطقه البرزغربی محاسبه شد. برای این تحلیل، از 3122 نگاشت متعلق به 170 زلزله، ثبت شده در فاصله کانونی 10 تا 70 کیلومتری استفاده شد. این زلزله­ها را دو شبکه محلی موقت با حدود چهل ایستگاه در بازه زمانی مارس 2012 تا اکتبر 2014 ثبت کردند. بزرگای گشتاوری زلزله­های انتخابی بین 8/1 تا 2/4 است؛ بنابراین می­توان با اطمینان آنها را به‌عنوان چشمه نقطه­ای درنظرگرفت. به‌کمک الگوریتم Robust Lowess، منحنی کاهندگی یک­تِکه در فرکانس­های متفاوت با استفاده از برازش غیرپارامتری به داده­ها به‌دست‌آمد. با فرض مدل کاهندگی یک­تِکه و با استفاده از رگرسیون، ضریب گسترش هندسی در معادله به‌دست‌آمده از روش طیفی، در فرکانس­های بالاتر از 2 هرتز، حدود 6/1 به‌دست‌آمد. ضریب گسترش هندسی محاسبه شده نزدیک به مقادیر گزارش شده برای بیشتر معادلات جنبش قوی زمین برای رویدادهای کم­عمق قاره­ای (NGA-WEST2 GMPE) است. با میانگین­گیری از مقادیر باقی­مانده دامنه در هر ایستگاه پس از برازش، تصحیح ایستگاهی دامنه برای تک‌تک ایستگاه­ها محاسبه شد. تصحیحات ایستگاهی محاسبه شده به‌طرزآشکاری اختلاف بین الگوی کاهندگی در شمال البرزغربی را در مقایسه با جنوب آن نشان می­دهد. ایستگاه­هایی که در دامنه­های شمالی البرزغربی (دشت گیلان) قرار گرفته­اند، کاهندگی کمتری نسبت به ایستگاه­های واقع در جنوب منطقه نشان می­دهند؛ بنابراین باید در تهیه نقشه­های تحلیل خطر لرزه­ای برای پهنه پرجمعیت گیلان به تفاوت جانبی کاهندگی دامنه امواج لرزه­ای توجه شود. The empirical attenuation relationship for spectral amplitudes was calculated to study the attenuation of shear waves of shallow events at close hypocentral distances inside Tarom-Rudbar region, western Alborz. 3122 waveforms (170 shallow events) recorded by 40 seismic passive stations of two local temporary seismic networks were included in this analysis. The selected events have moment magnitudes between 1.8 and 4.2 and epicentral distances of 10 km to 70 km. All events have location accuracy better than 2 km in epicenter and less than 5 km in depth. The good location quality of the events allows us to estimate accurately geometrical spreading of shear waves at close hypocentral distances. By selecting the small events, we can safely treat them as point sources and thus use hypocentral distance as our distance metric. Additionally, for smaller events, we automatically avoid the non-linearity of amplitude of seismic waves with magnitude and its possible trade-off with geometrical spreading. Due to a rather low dependence of geometrical spreading on magnitude (v. NGA-WEST2 models), our approach of using weak-motion data may provide a means to reliable assessment of the geometrical spreading coefficient which can then be used to partially regionalize NGA-WEST2 GMPEs for regions with low rate of seismicity or lack of enough strong motion records. The shape of the attenuation curve at different frequencies was obtained using non-parametric fit to the data with Robust Lowess algorithm showing a mono-linear curve in the associated distance. Assuming mono-linear attenuation model and using regression, the value of geometrical spreading coefficient in the equation derived from the spectral method was obtained as 1.6 in frequencies higher than 2 Hz. Spectral amplitude attenuation curves show an obvious super-spherical geometrical spreading at close hypocentral distances. We show that the geometrical spreading is strongly super-spherical in close agreement with those used in some of the NGA-WEST2 GMPEs. The observed super-spherical geometrical spreading of seismic waves could drastically change the level of seismic hazard in close hypocentral distances by localizing strong motion to short hypocentral distances. The calculation of geometrical spreading coefficient using data from more frequent small events recorded by dense local networks can be used to partially regionalize the geometric term of GMPEs in regions with small rate of seismicity. The residuals were averaged on a station-by-station basis to determine station corrections. The calculated station corrections for the study area shows sharp contrast between the northern and southern hills of western Alborz. The stations in the northern hill, mostly in Gilan plain, show higher amplification (positive station corrections) relative to those in the southern hill. The strong amplification of seismic waves has a strong implication for preparation of seismic hazard maps of the densely populated Gilan province. متقی، خ.، ضرونی­زاده، ز.، قدس، ع.، 1395، محاسبه کاهندگی طیف دامنه جنبش زمین در شمال‌غرب ایران، مجله ژئوفیزیک ایران، 10(4)، 128-141. Atkinson, G. M., 2004, Empirical attenuation of ground-motion spectral amplitudes in southeastern Canada and the northeastern United States: Bulletin of the Seismological Society of America, 94, 1079–1095. Atkinson, G. M., 2015, Ground-motion prediction equation for small-to-moderate events at short hypocentral distances, with application to induced-seismicity hazards: Bulletin of the Seismological Society of America, 105(2A), 981–992, doi:10.1785/0120140142. Atkinson, G. M., and Boore, D. M., 1995, New ground motion relations for eastern North America: Bulletin of the Seismological Society of America, 85, 17–30. Atkinson, G. M., and Mereu, R., 1992, The shape of ground motion attenuation curves in southeastern Canada: Bulletin of the Seismological Society of America, 82, 2014–2031. Berberian, M., and Walker, R., 2010, The Rudbār Mw 7.3 earthquake of 1990 June 20; seismotectonics, coseismic and geomorphic displacements, and historic earthquakes of the western “High-Alborz”, Iran: Geophysical Journal International, 182(3), 1577–1602, doi:10.1111/j.1365-246X.2010.04705.x. Boore, D. M., 2004, Estimating (30) (or NEHRP Site Classes) from shallow velocity models (Depths < 30 m): Bulletin of the Seismological Society of America, 94, 591-597. Boore, D. M., 2010, Orientation-independent, nongeometric-mean measures of seismic intensity from two horizontal components of motion: Bulletin of the Seismological Society of America, 100, 1830–1835. Boore, D. M., Campbell, K. W., and Atkinson, G. M., 2010, Determination of stress parameters for eight well-recorded earthquakes in Eastern North America: Bulletin of the Seismological Society of America, 100(4), 1632–1645, doi:10.1785/0120090328. Boore, D. M., Stephens, C. D., and Joyner, W. B., 2002, Comments on baseline correction of digitalstrong-motion data: examples from the 1999 Hector Mine, California earthquake: Bulletin of the Seismological Society of America,92, 1543–1560. Boore, D. M., Stewart ,J., Seyhan, E., and Atkinson, G. M., 2014, NGA-West2 equations for predicting response spectral accelerations for shallow crustal earthquakes: Earthquake Spectra, 30, 1057–1086. Brune, J., 1970, Tectonic stress and the spectra of seismic shear waves from earthquakes: Journal of Geophysical Research, 75, 4997–5009. Brunet, M. F., Korotacv, M. V., Ershov, A. V., and Nikishin, A. M., 2003, The South Caspian Basin: a new review of its evolution from subsidence modeling: Sedimentary Geology, 156, 119–148. Campbell, K. W., 1997, Empirical near-source attenuation relationships for horizontal and vertical components of peak ground acceleration, peak ground velocity, and pseudo-absolute acceleration response spectra: Seismological Research Letters, 68, 154–179. Campbell, K. W., Eeri, M., and Bozorgnia, Y., 2014, NGA-West2 ground Motion model for theaverage horizontal components of PGA , PGV , and 5 % -damped linear acceleration responsespectra: Earthquake Spectra, 30(3), 1–38, doi:10.1193/062913EQS175M. Chen, S., and Atkinson, G. M., 2002, Global comparisons of earthquakes source spectra: Bulletin of the Seismological Society of America, 92, 885–895. Chiou, B. S. J., and Youngs, R. R., 2014, Update of the Chiou and Youngs NGA model for the average horizontal component of peak ground motion and response spectra: Earthquake Spectra, 30(3), 1117–1153, doi:10.1193/072813EQS219M. Chiou, B. S. J., Youngs, R. R., Abrahamson, N. A., and Addo, K., 2010, Ground motion attenuation model for small-to-moderate shallow crustal earthquakes in California and its implications on regionalization of ground motion prediction models: Earthquake Spectra, 26, 907–926. Cleveland, W. S., 1979, Robust locally weighted regression and smoothing scatter plots: Journal of the American StatististicalAssociation, 74, 829–836. Conn, A. R., Gould, N. I. M., and Toint, Ph. L., 2000, Trust-Region Methods: Society for Industrial and Applied Mathematics (SIAM), Philadelphia, 956 pp. Engdahl, E. R., Jackson, J. A., Myers, S. C., Bergman, E. A., and Priestley, K., 2006, Relocation and assessment of seismicity in the Iran region: Geophysical Journal International, 167(2), 761–778, doi:10.1111/j.1365-246X.2006.03127.x. Frankel, A., 2015, Decay of S‐wave amplitudes with distance for earthquakes in the Charlevoix, Quebec, area: Effects of radiation pattern and directivity: Bulletin of the Seismological Society of America, 105(2A), 850–857. Ghasemi, H., Zare, M., Fukushima, Y., and Koketsu, K., 2008, An empirical spectral ground-motion model for Iran: Journal of Seismology, 13(4), 499–515, doi:10.1007/s10950-008-9143-x. Ghofrani, H., and Atkinson, G. M., 2014, Site condition evaluation using horizontal-to-vertical response spectral ratios of earthquakes in the NGA-West 2 and Japanese databases: Soil Dynamics Earthquake Engineering, 67(August), 30–43, doi:10.1016/j.soildyn.2014.08.015. Gregor, N., Abrahamson, N. A., Atkinson, G. M., Boore, D. M., Bozorgnia, Y., …, and Youngus, R., 2014, Comparison of NGA-West2 GMPEs: Earthquake Spectra, 30(3), 1179–1197, doi:10.1193/070113EQS186M. Hutton, L. K., and Boore, D. M., 1987, The ML scale in southern California:Bulletin of the Seismological Society of America, 77, 2074–2094. Jiménez, A., García, J. M., and Romacho, M. D., 2005, Simultaneous inversion of source parameters and attenuation factor using genetic algorithms: Bulletin of the Seismological Society of America, 95 (4), 1401–1411. Kaz’min, V. G., and Verzhbitskii, E. V., 2011, Age and origin of the South Caspian Basin: Oceanology, 51(1), 131–140, doi:10.1134/S0001437011010073. Knapp, J. H., and Connor, J. A., 2004, Crustal-scale structure of the South Caspian Basin revealed by deep seismic reflection profiling: Marine and Petroleum Geology, 21, 1073–1081. Kramer, S. L., 1996, Geotechnical Earthquake Engineering:Prentice Hall, University of Washington, USA, 653 pp. Menke, W., 2018, Geophysical data analysis: Discrete inverse theory. Academic press. Motaghi, K., and Ghods, A., 2012, Attenuation of ground‐motion spectral amplitudes and its variations across the Central Alborz mountains: Bulletin of the Seismological Society of America,102, 1417-1428. Motazedian, D., 2006, Region-specific key seismic parameters for earthquakes in Northern Iran: Bulletin of the Seismological Society of America, 96, 1383–1395. Motazedian, D., and Atkinson, G. M., 2005, Ground motion relations for Puerto Rico: Geological Society of America bulletin, GSA, 385, 61–80. Nakajima, J., Hada, S., Hayami, E., Uchida, N. , Hasegawa, A., Yoshioka, S., Matsuzawa, T., and Umino, N., 2013, Seismic attenuation beneath northeastern Japan: Constraints on mantle dynamics and arc magmatism: Journal of Geophysical Research, Solid Earth, 118, 5838–5855. Oppenheim, A. V., 1999, Discrete-time signal processing: Pearson Education India. Ou, G., and Herrmann, R. B., 1990, A statistical model for ground motion produced by earthquakes at local and regional distances: Bulletin of the Seismological Society of America, 80(6), 1397–1417. Pratt, T. L., Brocher, T. M., Weaver, C. S., Creager, K. C., Snelson, C. M., Crosson, R. S., Miller, K. C., and Tre, A. M., 2003, Amplification of seismic waves by the Seattle Basin , Washington State: Bulletin of the Seismological Society of America, 93(2), 533–545. Sorensen, D. C., 1982, Newton’s method with a model trust region modification: SIAM Journal on Numererical Analysis, 19(2), 409–426. Srinagesh, D., Singh, S. K., Chadha, R. K., Paul, A., Suresh, G., Ordaz, M., and Dattatrayam, R. S., 2011, Amplification of seismic waves in the Central Indo-Gangetic Basin, India: Bulletin of the Seismological Society of America, 101(5), 2231–2242, doi:10.1785/0120100327. Wald, D. J., and Allen, T. I., 2007, Topographic slope as a proxy for seismic site conditions and amplification: Bulletin of the Seismological Society of America, 97, 1379–1395. Wu, Q., Chapman, M. C., Beale, J. N., and Shamsalsadati, S., 2016, Near‐source geometrical spreading in the Central Virginia seismic zone determined from the aftershocks of the 2011 Mineral, Virginia, earthquake: Bulletin of the Seismological Society of America, 106(3), 943–955. Zare, M., 1999, Conribution à létude des mouvements forts en Iran: Du catalogue aux lois d`atténuation: Thése de Doctorat, Université de Grenoble at Saint-Martin-d'Hères, Franc (in French). Zare, M., Bard, P. Y., and Ghafory-Ashtiany, M., 1999, Site characterizations for the Iranian strong motion network: Soil Dynamics Earthquake Engineering, 18, 101–123. Zare, M., and Sabzali, S., 2006, Spectral attenuation of strong motions in Iran: Proceeding of the 3rd international symposium on the effects of surface geology on seismic motion, Grenoble, France, 30 August–1 September 2006.